the Punjab state farmers commission has recently asked the state government to make delayed-sowing of rice mandatory. The move comes at a time when agriculture in Punjab is facing its worst spell since 1970. Last year, the state recorded 1.86 per cent growth in farming. Moreover, groundwater resources in the state have taken a sharp dip. In a desperate move to arrest the falling water table, the state electricity board restricted power supply to the farmers. Experts say the crops, if sowed late, consume less water, eventually helping in saving groundwater (see figure Late remedy). A guzzler called rice Experts cite many reasons to the fall of water table. The cultivation pattern--monoculture of rice and its early sowing--is one among them. Rice production in the state has today touched 5.8 tonnes per hectare (ha). This high yield, say experts, has affected the water levels. "Thirty years back, the level was at 4 to 5 metres (m) down. Today it is 30 m at places," says G S Hira, a scientist formerly with the Punjab Agricultural University (pau). According to experts, cultivation of rice crops--summer rice or sathi and the monsoon rice--has aggravated the groundwater depletion. Under dry conditions, rice needs to be irrigated 24 to 28 times, constituting 37 per cent of the total water demand of Punjab. "Soil and climate here don't favour rice," says B L Bharadwaj of pau. "The current pattern of farming includes a rotation of wheat and rice. This has led to heavy use of groundwater, especially in the central districts," says V Beri of pau. Growing dependence on groundwater has also seen a growth in tubewells. "Over 70 per cent of the tubewells in the state are in the central districts and about 85 per cent of the land is used for rice during kharif season," says Hira. As a consequence, "118 of the 138 blocks in Punjab are overexploited," says S P Mittal, formerly with the Indian Council of Agricultural Research, New Delhi (see map Spreading creeks). Area irrigated by tubewells has gone up from 0.2 million to 2.4 million ha in the last decade. Drop paddy Experts say the region is farming the wrong crop. "Central Punjab has very little of heavy clayey soil which is essential for rice cultivation," says Satpal, an agronomist at pau. "Punjab can grow rice on just 1.8 million ha--the area which gets recharged from rainfall, streams and canals. 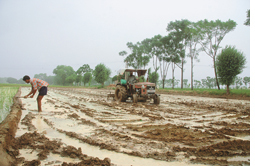 But 2.6 million ha is under the crop," says G S Kalkad of the state farmers commission (psfc). Scientists with pau ask farmers to move away from paddy and replace it with less-water-requiring but high value crops. "Reduce 10 per cent of the rice area by sowing two crops of moong," advises V K Arora, a soil scientist. For two crops, he says, a farmer can earn up to Rs 40,000 per 0.4 ha, Rs 10,000 more than what paddy gives. "Moreover, about 90 per cent of water can be saved," he adds. But there are some concerns. "I had cultivated moong in 10 acres last year. But prices for moong fell from Rs 3,300 to Rs 2,300 per quintal. So I opted out," says Hardev Singh of Jalaldiwal village in Ludhiana. "This also shows the slow rate of diversification of crops in Punjab," says Manjit Singh, agricultural development officer, Nihalsinghwala in Moga district. However unlike paddy, these crops don't enjoy support prices. "Unless the government ensures this, crop diversification will remain an elusive goal," says R S Sidhu, an economist with pau. The pusa 44 hybrid variety of rice which the farmers cultivate today takes a longer period to mature. It is prone to diseases like the bacterial leaf blight disease. Due to the longer maturity period, farmers sow it in May so that it matures on time, making it vulnerable to the pests affecting saplings planted late. "This variety of rice is meant for Bihar, western up and some parts of Haryana," says Beri. pau has recently developed a new variety in 2007 pau 201, which, according to Bharadwaj, is "resistant to eight diseases; matures in 144 days and gives a yield of 30 quintals per acre". It takes 30 per cent less water than pusa. "Cultivating such varieties in just 10 per cent of the rice area can save about 78 million kwh of electricity worth Rs 23 crore," Hira says. But some do not buy it." pau varieties live up to three years; but the yield lessens subsequently. We tried pr 114, a similar seed, in 2003 but the yield was 10 quintals per acre," says Chamkaur Singh, a farmer in Dhudhike in Moga. Punjab has exhausted its upper layer of groundwater and farmers are now using high-horsepower pumps. "Till 2006, submersibles replaced about 30 per cent of the centrifugal pumps in the state, to draw in deep lying water," says Beri. The trend has also taken its toll on the state's demand for electricity. The rush for powerful pumps has caused financial problems to many of the farmers. "These new pumps with generators cost up to Rs 1.5 lakh," says Harminder Singh of Jalaldiwal village in Ludhiana. The need to deepen tubewells for the submersibles has also grown. "In Dhudhike, about 70 tubewells were dug from January to June this year," says Manjit Singh, a tubewell dealer. People who cannot afford powerful pumps buy water from their neighbours who own pumps. "Water is sold for Rs 20 to 30 per hour. This is cheaper compared to spending on diesel at Rs 60 per hour," says Rajrani Bakhtuane of the Bharatiya Kisan Union Ekta-Ugrahan in Faridkot. "In 2006, tubewells consumed 7,500 million kilowatt hour (kwh) of power. Punjab gives an electricity subsidy of Rs 2,400 crore. Of this, Rs 1,500 crore is given to rice cultivators," says Hira. The high demand prompted Punjab to buy power for Rs 2,800 crore in 2006-07. Transplanting--planting of seedlings--rice seeds during mid June to late May is wrong, say experts. A recent study by the Central Soil Salinity Research Institute, Karnal, says that early sowing takes more than 1.5 times more water. "Timely transplantation of the rice can cut down water depletion," says Hira. "Planting fine varieties like basmati in the first fortnight of July can get a better harvest without using pesticides," he adds. If transplanted in May, rice evaporates 70 to 80 cm of water. But if the sowing takes place in later June, say experts, this can be 55 to 60 cm. "By this way, the fall in the water table can be checked by 5 times," says S K Jalota of pau, adding, "Frequency of irrigation can be minimised and deep-pumping can be reduced." As Hira says, "pushing rice to June 10 can save 1,950 million kwh of energy costing Rs 585 crore. A further delay to June 30 will result in additional energy savings of 1,560 million kwh worth Rs 468 crore." Of late, about five per cent of the farmers have started transplanting rice after June 10 and by June 30 more than 90 per cent of the farmers have adopted the system. In some areas like Gurthari-Haritpura in Barnala, there are visible changes. "Late transplantation has helped table remain stable at 21 m here," says Pyara Singh, ex-sarpanch. Since 2006, most of the farmers have been forced to transplant late, thanks to the cut-off date for power supply by the state electricity board. "The June 10 cut-off date was to discourage the farmers from going in for early sowing of rice," says Bharadwaj. "We got power for eight hours after June 10, 2006 and had to go in for late transplantation," says Chamkaur Singh. However, experts say that the time frame for late transplanting cannot be constant given the changing monsoon pattern in the country. Many say that Punjab should regulate misuse of ground water. "The need is to enforce the Model Bill on Groundwater Regulation as advised by the Union government," says Avinash Mishra, deputy advisor for water resources with the Planning Commission in New Delhi. The authorities say the bill will help reduce exploitation of water and will support the farming sector in Punjab. WE PERFORM PUJA JUJNA TO PURIFY THE AIR, THE TREES ARE NTMOST IMPORTANT FEACTOR TO PURIFY THE AIR.